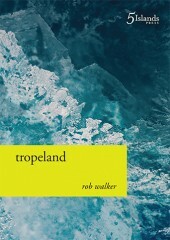 South Australian poet Rob Walker’s latest collection, tropeland, is exceptionally playful. Puns and wry twists in language are balanced with humour and a self-conscious sense of otherness, the speakers always slightly displaced from their subjects. Walker is not pessimistic in this process however; there is a consistently optimistic tone throughout tropeland, as well as a canny awareness of failings and ironies in life. To pin down tropeland structurally is to do the text no justice. Walker is diverse in his renderings of themes, foci and poetic processes, constantly shifting from one style to another but still maintaining a firm sense of self and the importance of open-minded observation. The poems observe nature, people and places in equal turns. Some of the more interesting poems include a five-part examination on trees, addresses to other poets and a number of reflections on Japan. there is a poet crying. she read her poem earlier. now it is not her turn to read. it’s her time to cry. sent it spilling onto the floor, a moan leaking from her eyes. the other poets ignore her, embarrassed. dictionaries with hair. bower birds of words. after all, she’s had her turn. boiled away to leave a black residue on white paper. It is unclear why such tears are warranted, but that is not the issue. Rather, the aversion to this display is chided. This snapshot encourages openness, rather than timely polite displays of necessary emotions. For Walker, emotional engagements are not timed precisely through the text either; these poems and situations are acknowledged with frank immediacy as and when required throughout the collection. The nudging criticism of ‘Crying at the Poetry Reading’ sits amongst more directly motivated pieces on loss and decisions about life and death such as ‘Watching My Blind Cat’ and ‘Clearview’, providing some particularly touching engagements with family and pets. Even though tropeland appears in three sections, there is no discrimination between the personal and public. The speaker moves self-consciously to an interior sense of location, after an initial disruption getting lost between train stations, buoyed by a growing confidence. The tree is utterly connected with human activity and intention, but Walker’s speaker finds a place for sympathy and kinship in recognition of its otherness. Throughout the collection as well there is a strongly anti-exploitative tone with regards to nature, already firmly established in this piece. tropeland is exceptionally dynamic. Rob Walker utilises a range of forms to explore a number of issues and settings with deftness, humour and sympathy all at once. Comedy and criticism come together other in the same poems, and offer multiple angles for further interpretation. This entry was posted in BOOK REVIEWS and tagged rob walker, Siobhan Hodge. Bookmark the permalink.